Local documentarians record "freaky" scene at Dakota Access Pipeline. When Robert Hunter saw a call-to-arms on social media from organizers in North Dakota asking for assistance winterizing a camp near the epicenter of a pipeline protest, he armed himself with a camera and prepared for a 36-hour drive to the northeast. 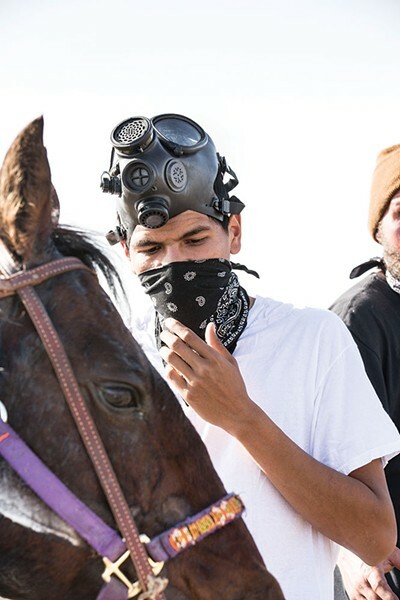 On a whim, Hunter, a member of the Blackfeet and Shoshone-Paiute tribes and a film student at Salt Lake Community College recruited a couple relatives as well as classmate Weston Bury and headed for the Dakotas to document the escalating conflict. "They put a call out for everybody who has the heart to go up there and help out in any way you can with your skillsets. If you're good at building things, come help build," he says. "I'm pretty skilled with a camera, I think. So I thought that was the only way I could contribute somehow. So I went up there with the intention of documenting as much as I could." The confrontation has graced headlines across the country. At the heart of it is the construction of a 1,200-mile oil pipeline that will run from North Dakota to Illinois. Environmental activists joined with Native American tribes and others in opposition to the project on grounds that it traverses sacred burial sites and risks contaminating drinking water should the pipe spring a leak. Supporters descended on the Standing Rock Indian Reservation at the North Dakota-South Dakota border in an attempt to halt construction. 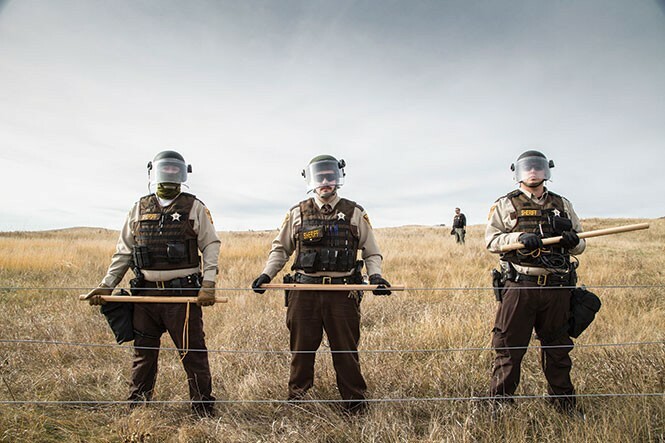 North Dakota responded by beefing up its police presence. The group arrived as a dicey standoff began to unfold. The demonstrators, who prefer to be referred to as "water protectors," had set up the 1851 Treaty Camp, a tactical blockade. Hunter and Bury obtained credentialed media passes and began shooting photos and videos. A horseshoe-shaped line of police fanned out across the landscape. "They were pretty armed. They had snipers. They had tear gas, Mace, rubber bullets," Hunter says. He captured the police action on film. Bury played a rough cut for City Weekly. Police slowly encroach on protesters to dismantle the camp. In one scene, a person brought to his knees by pepper spray wipes his face and eyes with a wet cloth. Hunter says he saw one person Tasered in the face. A group of demonstrators hunkered together to pray. "There were around 46 people—men, women and elders—who joined hands and formed a prayer circle. They just started praying," Hunter says. "Every single person in that circle got arrested that day." One of Hunter's relatives was among the detainees, who he says were threatened with felony charges for their civil disobedience. Hunter witnessed law enforcement unload canisters of pepper spray on demonstrators, shred tents with knives, spray paint X's on teepees and tear down sacrosanct sweat lodges. Bury, a single father of a 10-year-old son, kept his distance—150 feet or so—to ensure he wasn't among the more than 130 arrested near the North Dakota reservation. He was close enough to hear disruptive noise blasted through the air, however. "They were using sound-wave technology, the new crowd-control stuff. So you had to put in earplugs or you would get sick," Bury says. "And it's so piercing that it makes it so you can't focus on anything, so most of us had to wear earplugs, which added a really new, strange dimension to the whole thing. Looking at it quiet is quite freaky. It brings everything into full relief." He hesitated to snap many photographs of distressed Natives, concerned that his gain would come at the cost of exploiting the tragedy, he says. He characterized it as a moral conflict. "I saw tons of people coming out banged up, beat up, covered in Mace, throwing up, still shaking from the Tasing if they hadn't been arrested," Bury says. After several days, the small Utah group arrived home, weary but loaded with footage and pictures. That same morning, a coalition that included Native American rights groups and environmental activists assembled in solidarity near Main Street. The demonstration reached its apex when the mass of about 100 flooded into the Wells Fargo Center lobby. Security called police, who promptly kicked out all but eight people. Those eight, some of whom had threaded a chain through bike locks closed around their necks, refused to budge. Outside protest chants resonated as onlookers watched the stalemate, which ended only after fire officials clipped the chain with a pair of bolt cutters. In succession, the eight were cuffed and escorted outside to a cordoned off segment at the Gallivan Center. Eventually, they were loaded onto a sheriff's office bus and hauled to jail. 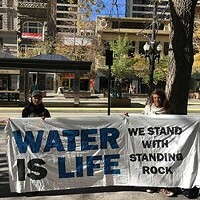 Outside the lobby, Wasatch Rising Tide organizer Natascha Deininger held a Standing Rock banner. She said large banks, such as those with offices in downtown Salt Lake City, are culpable backers of the pipeline's construction. "We came this morning together to lay down prayers and stand in solidarity with the people up in North Dakota, and a massive piece of the North Dakota Access Pipeline has been the funding behind it," she said. "The pipeline would not be possible if big financial institutions didn't provide the means to do it." 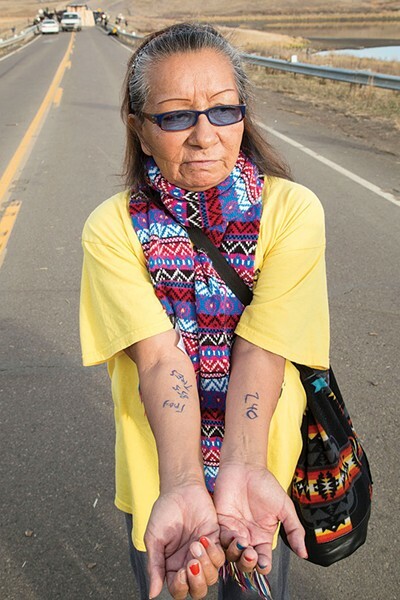 Repeatedly, protesters sang an adapted refrain, written by the New York City-based Peace Poets: "The ground is shaking/ 'cause all the nations/ have come to say/ the land is native/ and they protect the water/ and they honor the land." Water is the common current connecting people from disparate lands to stand with protesters in North Dakota. Those arrested in Salt Lake City, reticent to talk about the event for fear that doing so could complicate potential legal defenses, sent out a statement expressing the need to protect water, land and the rights of indigenous people. "Water is life!" one sentence exclaims. The day after eight were arrested by city police, Mayor Jackie Biskupski repeated the water-is-life slogan at a press conference where she proclaimed November as Native American Month. The city figurehead put to rest any doubt that Salt Lake is too far removed from Standing Rock to be concerned. Biskupski signed her name onto a letter bound for President Barack Obama, urging the feds to halt the pipeline's construction. The document, also signed by mayors in Seattle, Los Angeles, Portland and Madison, Wis., asserts the need for a full examination of the project's environmental and cultural impacts before it moves forward. "We believe there is too much at stake to get this wrong," she read from a prepared statement. "Our hearts break at the thought of decimating sacred lands. We fear the contamination of water and the effects that would have on the local environment. And we have deep concern of the long-term climate change impacts caused by the burning of fossil fuels." James Singer, founding member of Utah League of Native American Voters, charged that the actions at Standing Rock revealed systemic racism, a disregard for climate change, unchecked power of corporations and an affront to tribes' inherent sovereignty. He spoke at City Hall, supporting the mayor's announcement. "Standing Rock has become a pivotal moment," he said. "People from hundreds of indigenous nations have assembled in one of the largest displays of solidarity in decades." 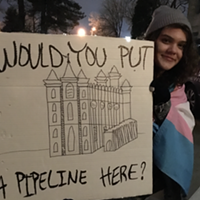 That evening, Obama indicated he could support a possible rerouting of the pipe to avoid interfering with sacred grounds. Bury and others say avoiding hallowed land is a good start but ignores pressing environmental concerns, namely global warming. Hunter and Bury expect they'll return to Standing Rock, so long as the conflict is not resolved. "Most likely I'm going back again for Thanksgiving," Hunter says. "I have family going back up there. We're going to go celebrate Thanksgiving at the camp and stay and be a family." Water protectors congregate to denounce Trump's DAPL reignition. Local “water protectors” celebrate Dakota Access pipeline decision.